One of the biggest outgoings in our house apart from the mortgage is the weekly supermarket bill. In recent years as little mouths grow bigger, the supermarket shop seems to grow bigger with them. Every week, I make a resolution that this will be the week I will set out to reduce the shopping bill and then when I get to the checkout, I realise that I have spent just as much as ever. 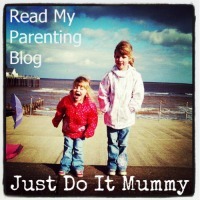 This month I was invited to take the Aldi Challenge which is an initiative running to encourage consumers to eat well and take part in extra activities. The Aldi Challenge is also about saving money and so having tasted some of their products recently, I wanted to see whether doing my weekly shop at Aldi would save me money on my supermarket bill. As you can see, we were able to find all of the same items we typically buy in other supermarkets and for cheaper. Although the savings on some of the products were quite small, this was compared to a fairly run of the mill supermarket. Obviously compared to a more premium supermarket it would be far greater. 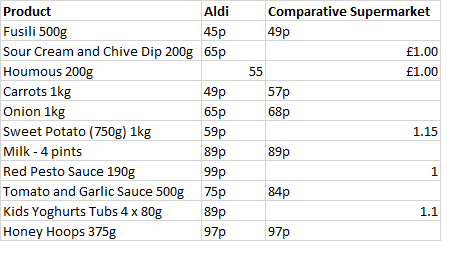 I would definitely recommend giving the Aldi Challenge a go as I did actually manage to save about £10 by going to Aldi, and average that out over the year, that's £520 if you were shopping every week do it definitely does add up! !